I come from an old, Jewish family: a group of men all named Abraham, and women who compete over the best brisket among them. We eat gefilte fish and tongue and chopped liver. We have a gallows sense of humor — “Could’ve just stayed in the shtetl,” my aunt said after my grandmother’s casket was lowered into her grave — and don’t really understand ham. When we talk to each other, we may start out with normal cadence, but somehow always slip into a vocal pattern that's vaguely reminiscent of Yiddish, and also invokes all the little old ladies of our collective youth: there’s the tilt of the head, the raise of an eyebrow, the lowering of the voice. Everything said like that sounds sad; even if it isn’t, there’re still qualifiers to remind us that it could be. Phrases like “She looks good” are followed up with the word "kenahora," which is a Yiddish way to knock on wood. We are rarely satisfied; we are happiest when complaining. We know it could’ve been worse for us. That thought — that just one ocean and a few decades was the difference between us and them — is never far from our minds. 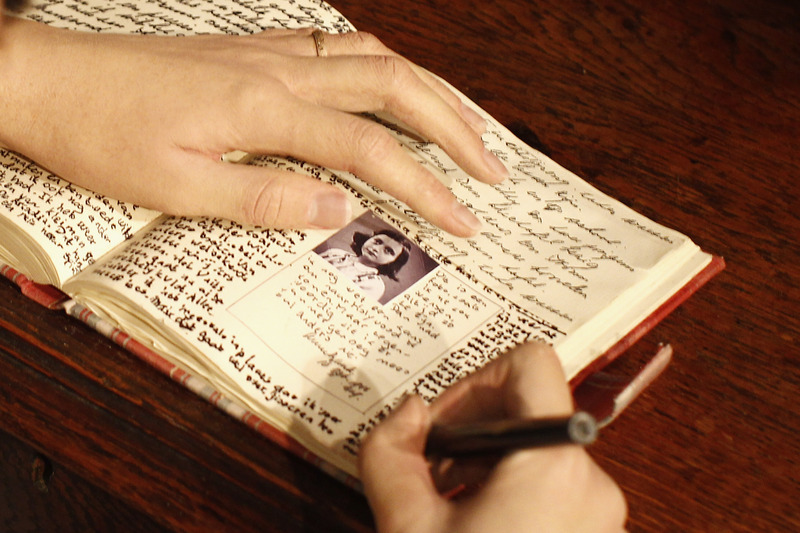 I don’t know how many times I’ve read Diary of a Young Girl: Anne Frank, but I remember the first time I did. I was in The Elephant, a loft-like structure in the back left corner of Mrs. Weiss’s 5th grade classroom. I was lying on my back, holding the book mere inches from my face and flipping swiftly through the pages. I wasn’t really paying attention at all until my eyes landed on the word labia. I sat up — it still felt scandalous to see such a private word in a book. I flipped to the front cover. Anne and those eyes of hers (those eyes!) stared back at me. She looked like my best friend Cecilia. I was intrigued. I inhaled the book over the next few days. It struck me how not-about the Holocaust it was; Anne was hiding from the Nazis, sure, but her situation felt almost beside the point. The hostility the young girl felt towards the adults in her life, the crush she developed on one of her hiding-mates, the desperation to try to understand her changing body — it all felt modern and identifiable and, for me, existed in a vacuum away from the larger forces in her world. As I got older, those early teenage issues faded into the background and I became consumed by the sadness of her story. I cared less about her writing and fell in love with the myth of her. My obsession with Holocaust stories grew; my fascination with them is not entirely unlike my penchant for reading true crime, in that they give me room to explore my own strength and consider the inhumanity of man from a safe distance. As I read more and more, I became simultaneously haunted and enthralled by Judaism’s ghosts. I became a Holocaust Girl. In her essay collection, Holocaust Girls, S.L. Wisenberg writes: “You don’t have to be Jewish to be a Holocaust Girl … what matters most is that you must love suffering.” And I did — I did feel something for suffering, but I didn’t love it as much as I did live, like most Jews do and have, with the fact of it. It’s not my suffering that I live with, though. My family got here far before the war and remained within comfortable Ashkenazic havens: my parents, both raised in West Hartford, Conn., reared my sister and me in the sometimes comically Jewish Scarsdale, N.Y. We had familial outposts in Boston and D.C., which both seemed similarly welcoming. I’ve had little experience with direct anti-Semitism (aside from a few snide comments from college acquaintances and a boss who asked if I was “Jewish or Jewish Jewish”). But sorrow is as Jewish a tradition as lighting the Sabbath candles, and as I grew older and more interested in redefining for me the faith I was brought up in, I did what all the other women in my family do — become totally obsessed with Holocaust literature. Locating these overlaps between historical suffering and private lives through Holocaust literature is a way for me to mourn, but also feels like I’m fulfilling a duty. Reading and rereading books like Anne Frank’s diary — I mean, especially Anne Frank’s diary — is the best way for me to connect to and commemorate a past that is mine on a large scale (the Jewish experience) and not mine on a smaller one (to hear those European police sirens and flee from my house with only a suitcase). Maybe this interest in Holocaust narratives is morbid, but it’s the only way I know how to keep the history alive.